The Constitution of the United States, which defines the system of government, was written and signed by fifty-five men, after meetings in Philadelphia, summer of 1787. 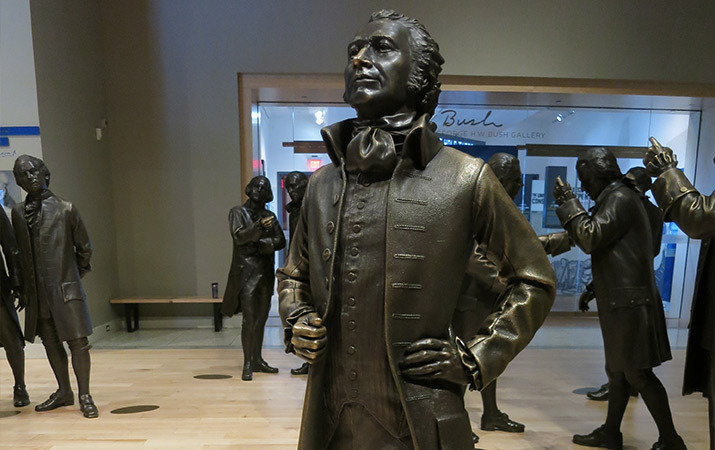 Definitely plan on a visit to the National Constitution Center on your next family trip to Philadelphia (best with older kids and teens, though little kids will have fun in the Signer’s Hall). A great place to start is the Sidney Kimmel Theater to watch a 360 degree multimedia production with live actor. How the Constitution created three independent branches to rule the nation: Executive (President), Legislative (Congress) and Judicial (Supreme Court, lower courts). 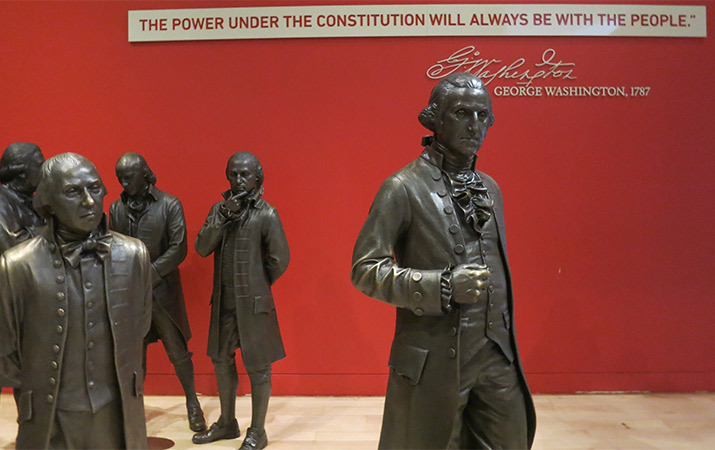 Leaving the theater, interactive exhibits explain the continuing story of the Constitution, amendments that guarantee basic freedoms, the first ten Bill of Rights (freedom of religion, freedom of speech, freedom of the press, etc.) and later additions, thirteenth amendment that outlaws slavery, and nineteenth amendment that gives women the right to vote. The Center also has temporary exhibits which change, such as “Powers of the President – Veto, Pardon, Appoint, Remove, Command” and how different presidents have used these powers. In the lobby are flags of each 50 states (kids can look for their home state), and a large board game about three branches of government. 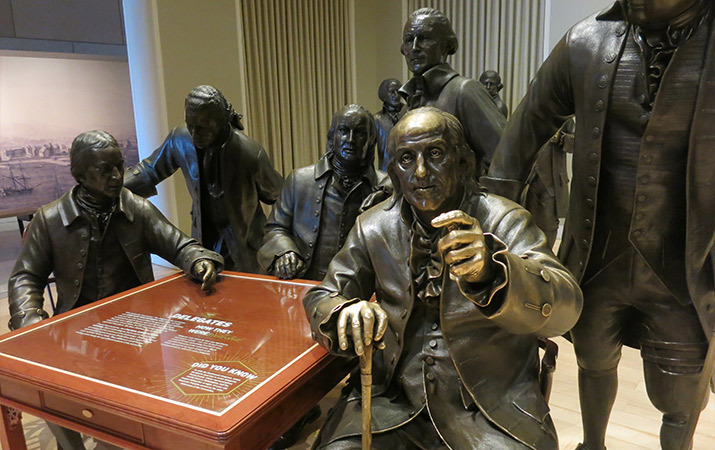 One of our favorite exhibits is the Signer’s Hall, with life-size bronze statues of the framers of the Constitution. 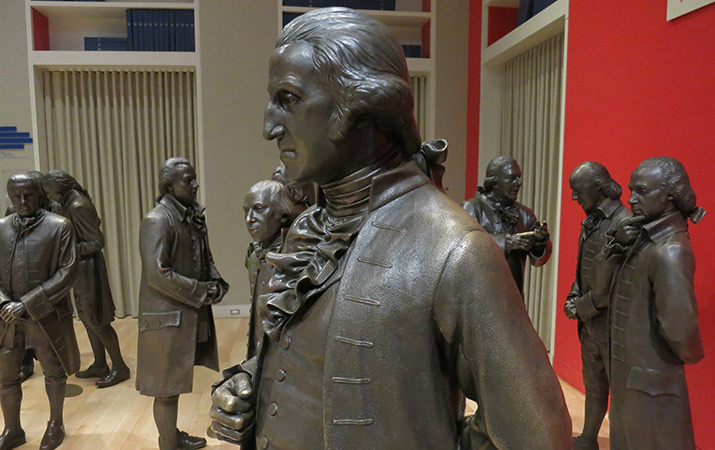 Statues are organized in groups, that dramatize the intense debate to create a framework for government. Senior statesmen Ben Franklin and George Washington were calm and dignified during the meetings, providing leadership over divided opinions. Kids can touch Ben Franklin’s bald head (he’s sitting down), behind him is Gouverneur Morris with a peg leg. Stand next to shorty Alexander Hamilton holding a cane, and there’s George Washington, over 6 ft tall, towering over other delegates. What is the Constitution? by Patricia Brennan Demuth. The United States Constitution by Nadja Baer, Nathan Lueth. 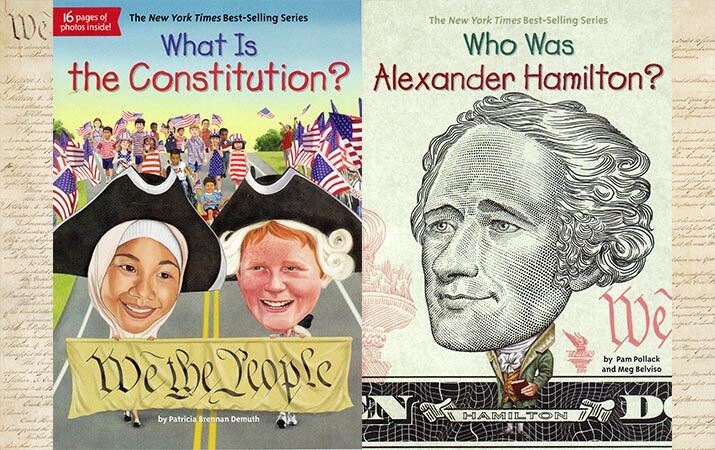 Who Was Alexander Hamilton? by Pam Pollack, Meg Belviso. Who Was George Washington? by Roberta Edwards. Who Was Ben Franklin? by Dennis Brindell Fradin, John O’Brien.